For over 48 hours, Andleeb Abbas, a PTI MNA and Imran Khan's Federal Parliamentary Secretary for foreign affairs remained quite regarding innocence of Zeeshan when her Govt's Propaganda Machinery was busy maligning the innocent no voice deads. 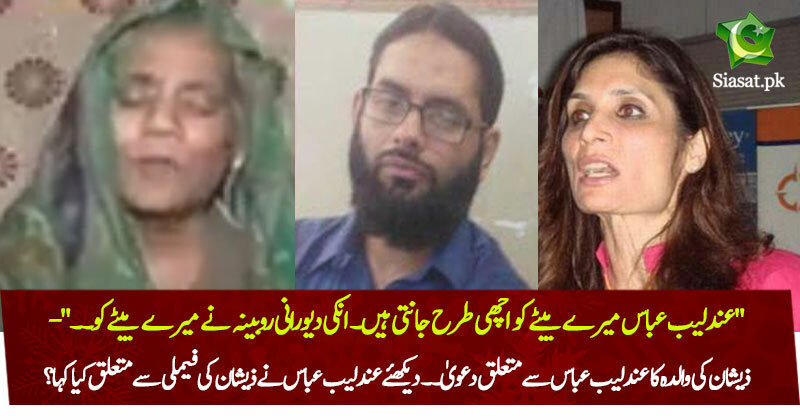 After Zeeshan's Mothers Exposition, Andleeb Abbas Admits that YES these people are innocent. Tou abb tou appreciate karna banta hai andleeb ko.. Agencies said Zeeshan is dehshatgard, buryha jhoot bolti hai. ISI zindabad , zeehan aur family murdabaad! Bhai tu CTD ko tu kos raha hai, magar CTD ko ghalat info aur intelligence kis ney dee? Allah unko gharat na karay? sarwar said, bare bare mlkon ma chotay choty waqyat hote rehte hain. CM said, vekhaan gy ki krna ae. PM said... sorry he didnt even say anything... he tweeted, dukhi hoon so sair ko doha ho ke ata hoon. fayyaz said, muawza de dain gy bhik mangon ko. Fat Amigo bhai tu Andleeb ko beech main na ragh! Pori GOvt ki phatti hui hai, Yeh bechary kia karaey. Agencies ne bola Zeeshan dehshatgard tu buss hogaya woh dehshatgard! Bhai tu nora katora label hojaiga. Bohat le raha hai PTI ki? Afsoos na kar, Dabaa ke bajao. I am labelled indian agent lol. I still make malshi ,boot polishi sweat. Keep up the honest work and keep Pakistan interest on top. Andleeb personally knew that Zeeshan was innocent but kept quite until Zeeshan's mother came on Tv and point blank marked her. Jee sir you are brutally honest thats why you are prominent with even only 400 posts. Andleeb personally knew that Zeeshan was innocent but kept quite until Zeeshan's mother came on Tv and point blank marker her. Pressure hai bhai, sab ki phatti hui hai. If she supports zeeshan openly she will loose her political career. ISI ki involvement na sirf CTD ne confirm ki balke govt ne b ki. second agar involve na hoti to aajkal to meme tk tweet ho rhi hain is pe to band na baja dete wo govt ki. what about government? should we stop believing them too?